Issue Notes: This is an anthology issue containing 10 separate stories. Booster Gold makes a cameo appearance in only one story. Appearance noted by Logan Peterson. Story Notes: All the stories in this issue are told by Rip Hunter, and it is not clear whether they take place in different timelines or different multiverses. It is also unclear whether they are true or fabricated. 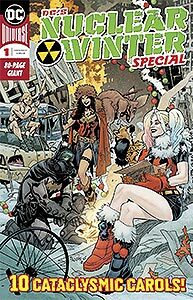 Therefore, it is impossible to be sure which incarnation of Booster Gold is seen in this issue. 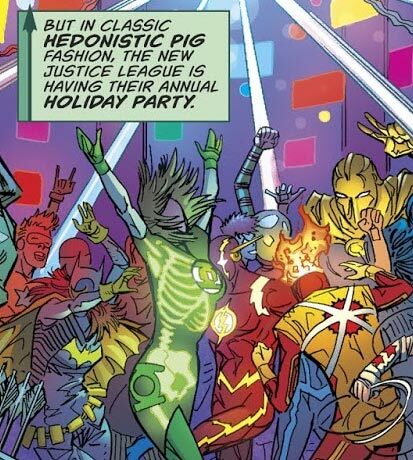 "Decades from now," Booster Gold can be seen among the dancing heroes at the Justice League's annual holiday party.